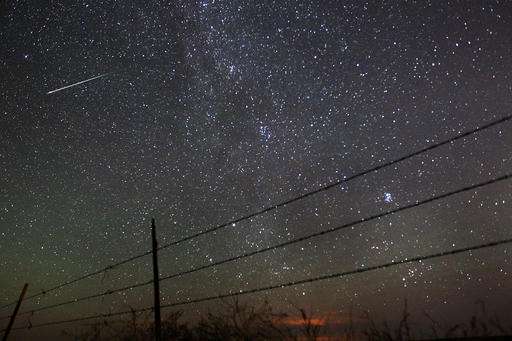 The heavens will be bursting with shooting stars this week.bThursday night into early Friday, the annual Perseid (PUR'-see-ihd) meteor shower is expected to peak with double the normal number of meteors. Scientists call this an outburst, and they say it could reach up to 200 meteors per hour. The last Perseids outburst was in 2009. Thanks to a gravity nudge from Jupiter, debris from comet Swift-Tuttle could stray closer to Earth again. These scattered specks of dust—a trail in the comet's wake—are what flash as they enter the atmosphere at a mind-blowing 132,000 mph and burn up. "Here's something to think about. The meteors you'll see this year are from comet flybys that occurred hundreds if not thousands of years ago," NASA meteor expert Bill Cooke said in a statement. "And they've traveled billions of miles before their kamikaze run into Earth's atmosphere." Scientists hope to capture the action with a new instrument at the International Space Station. The U.S.-Japanese experiment's name is appropriately named Meteor. An August tradition, the Perseids are so named because the meteors appear to emanate from the constellation Perseus, the Medusa-killing hero of Greek mythology.